Explanation: The largest single-dish fully steerable radio telescope began operation in 2000 August in Green Bank, West Virginia, USA. 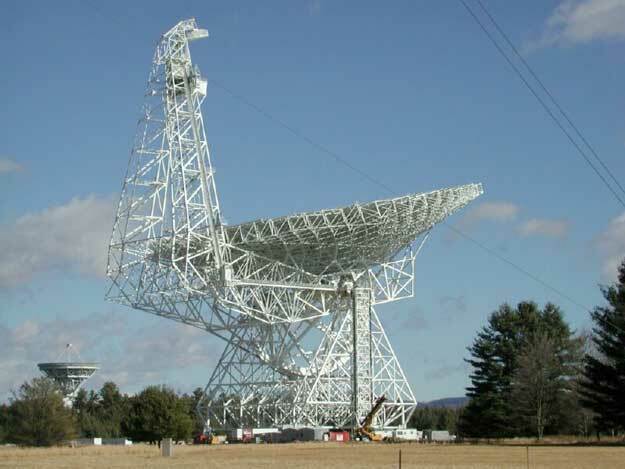 Dedicated as the Robert C. Byrd Green Bank Telescope, the device weighs over 30 times more than the Statue of Liberty, and yet can point anywhere in the sky more precisely than one thousandth of a degree. The main dish is so large that it could house a football game, allowing it to hear even the faint murmurs of quasars located across the universe. Anyone can propose to use the Green Bank Telescope, although formal proposals are reviewed competitively. The Green Bank Telescope's large size and innovative design are allowing it to investigate radio waves emitted from comets, planets, pulsars, distant galaxies, and the distant early universe.